Before we get started, I imagine a lot of you will be thinking this sounds slightly crazy; the idea of using vinegar to treat heartburn is counter-intuitive and goes against much of the advice we would have been given whilst growing up. Bear with us, all shall become clear. Heartburn, or acid reflux, can be an extremely uncomfortable and is yet a common occurrence. Characterized by a burning sensation in the throat or chest, as well as acid coming back up from the stomach into the throat. But why does it happen? And how can we treat it without the need for chalky tasting indigestion tablets which only provide relief for a short time? Acid reflux is the result of excess hydrochloric acid making its way back up the oesophagus (the tube that carries food from our mouths to stomach). This happens when our stomach has insufficient levels of acid to properly digest food and makes more, causing our lower oesophageal sphincter (LES) to open periodically thus allowing acid to rise up. A lack of stomach acid is known as Hypochlorhydria and can happen for a number of reasons, although as we grow older, our levels drop naturally. Stomach acid levels are critical for good digestion. It is these acids that break down our food from solid matter into absorb-able nutrients. Low levels of stomach acid leave our bodies struggling to absorb vital nutrients including; minerals (Iron, Copper, Zinc, Calcium etc), Vitamin B12, folic acid and proteins. Another key reason healthy levels of stomach acid are crucial for good health is the way they aid our immune system. Our stomach acts as a natural acid barrier that helps to quickly kill any bad bacteria or bugs that happen to enter our system. Apple cider vinegar is a fermented liquid rich in naturally occurring acids that help to return our stomach pH to functioning levels. This helps to stop reflux by enabling our LES to remain closed. Next time you feel acid rising, or that burning sensation in your chest, reach for a bottle of raw ACV and find out for yourself. In addition to its fast acting relief from heartburn, it is believed that the malic acid in apple cider vinegar can offer antiviral, antibacterial and antifungal properties, all of which benefit our overall health. This is a very simple to follow concept that can be easily included in your daily routine. You will need a plastic water bottle, a tablespoon, one bottle of high quality apple cider vinegar and some natural spring or mineral water. We are going to make an apple cider vinegar solution that can be easily drank before each meal throughout the day. This helps to increase our stomach acid levels at the crucial time; just before they get to work digesting our food. The first step is to almost fill an 8oz bottle with your natural spring water. It is important to use a source of good quality water as we are looking to avoid contaminants including chlorine and artificial fluorides. The second step is to add the apple cider vinegar. Measure out two tablespoons of ACV and add to your bottle of water. Stir the mixture. Don't worry about the bits you can see floating about, these are just the enzymes and good bacteria known as 'The Mother' that hold many of apple cider vinegar's health benefits. Put your bottle in your bag and take it with you, making sure to drink a little before each meal. Will any apple cider vinegar do? Unfortunately not. Like most things in life, ACV comes in many shapes and sizes and some of the cheaper brands of apple cider vinegar offer an inferior quality product. The key things to look for when buying apple cider vinegar for internal use are words like raw, unfiltered, organic and containing 'Mother'. The Mother is the name given to the floating semi-solids and sediment that can be seen in bottles of good quality ACV. It is created by good bacteria added in the second fermentation process. 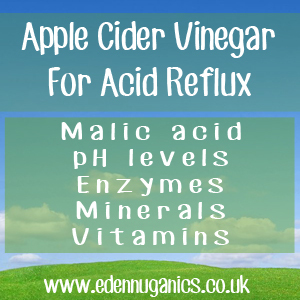 Although apple cider vinegar is great at treating even the most stubborn cases of heartburn, having the correct diet is essential if you're looking to remove the problem from your life altogether. Some of the best foods to include in your diet are fresh green vegetables, nuts and fish. Avoid alcohol, dairy and processed foods when suffering from heartburn as these will only worsen the condition. Check some of our other articles for more great uses of apple cider vinegar.